Goulburn Weir & South Murchison Honour Roll comprises two marble plaques with carved lettering. 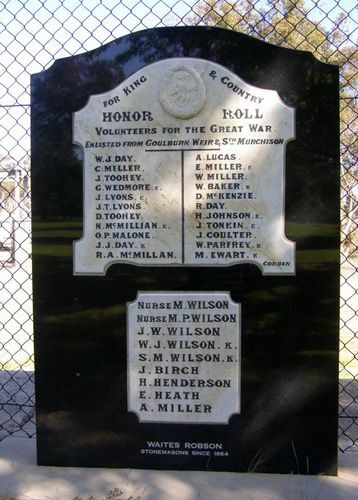 The plaques commemorate 31 volunteers and nurses who enlisted in the First World War from the Goulburn Weir and South Murchison districts. A ceremony of an interesting and impressive nature was performed in the public gardens at the Goulburn Weir on Saturday evening last, the occasion being the unveiling of the Roll of Honor recently erected by the committee to perpetuate the memory of the boys who answered their country's call from that district. Owing to the fact that the monument was to he erected in the open and would thus be exposed to the weather the committee resolved to purchase a marble tablet, and this has been erected on a wooden pedestal just inside the main entrance to the gardens. There was a huge attendance of relatives of the boys and residents of the district and the task of performing the unveiling ceremony had been allotted to Mr John Gordon, M.L.A. Mr. Gordon was received with applause, expressed his thanks to the Weir people for the honor they had bestowed upon him in allotting to him the pleasant duty of unveiling this monument to the valor of the boys who had gone forth to assist the Empire in its hour of need. The twenty names inscribed on the tablet spoke volumes for the patriotism of the people of the Weir district, and he understood there were other names yet to be added. He extended his congratulations to one of those brave men (Lance-Corporal James Day) on his valorous achievement in winning the Military Medal, and quoted the words of praise recently uttered by General Monash on the valor and bravery displayed by the Australian troops in general. When one glanced at that small tablet and realised that five out of the twenty had made the supreme sacrifice they realised how terrible war was. He congratulated those men amongst the audience who had done their bit and had returned. Murchison Advertiser and Murchison, Toolamba, Mooroopna and Dargalong Express (Vic), 4 January 1918.